Get it, shmokin, as in smoke bombs. Yeah…ok it wasn’t that great was it but hey these photos speak for themselves without any cheesy title of mine! 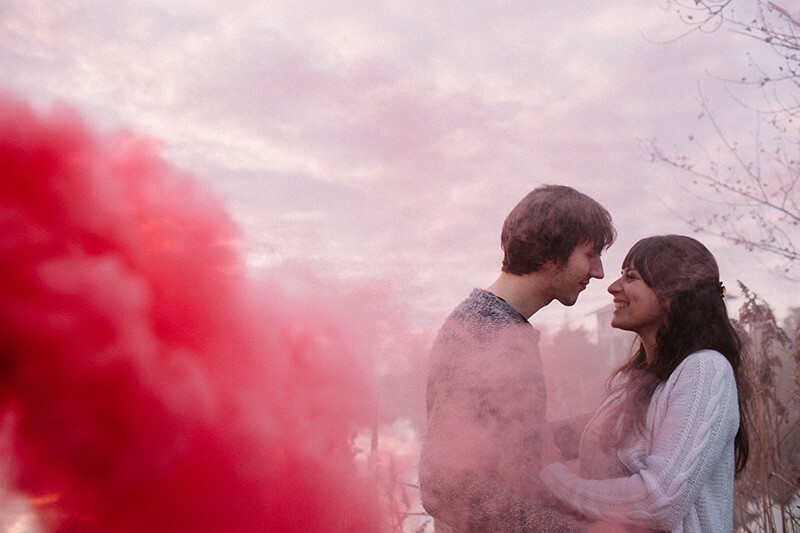 If you want to add some pops of colour to your engagement shoot but don’t have anywhere colourful to shoot it then using bright smoke bombs can be a great alternative! Plus, how fun would it be to set these off and have a good ol’ smooch with your partner amongst all of that colour? That’s exactly what Caterina & Chris did and we love how their shoot turned out! “I’d met Caterina 2 years ago, in a small village in the center of Italy, the city called Recanati, the small village in which Giacomo Leopardi the italian famous poet was born. She is an Italian photographer and one day she decided to go to Germany for many reasons. She is searching for new inspirations in work, love and life. She arrived in Berlin. After a couple of months, one night she decided to go to a party, and here, in one second she understood that the man she is looking for, he was exactly just some meters distant from her. It was a love at first sight. She asked him to dance. He accepted and since that night Chris, Scientist of Quantum Physics , and Caterina, italian photographer, are a single soul. Last December they came in Italy for a short break and they decided to contacted for this shooting. What a fantastic session!!! Love a couple who tries something different and experimental like this.